The Model 15 Suspended Solids Sensor incorporates near infrared technology, solid state electronics, and custom geometry. Our near infrared technology provides increased dependability of the reading when color changes in the solids occur. Our solid state electronics increases consistency of the reading and reliable digital communications up to 2000 ft.
Our custom geometry optimizes the sensor for its measurement range and facilitates the integrated jet clean. Our continuous SS sensors come standard with tool free ¼" O. D. tubing connectors for the integrated jet clean and 33ft (10m) of sensor communications cable. Additional cable length is available upon request. Below are the available sensor options. The Model 15 Sensor is our standard sensor mount. 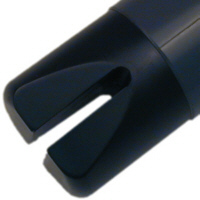 This model features all of the above with a PVC 1-½" NPT male mounting thread. The Model 15L Sensor is designed to measure very low solids concentrations typically found in secondary clarifier and plant effluents. 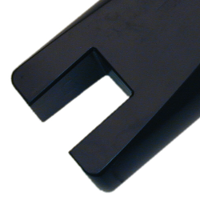 This model has a PVC 1-½" NPT male mounting thread. The Model 15PI Sensor is intended for in-line monitoring in a large diameter pipe . The mount is 2" NPT male thread in 316 stainless steel that works with a customer supplied 2" Thread-O-Let. The integrated jet clean with this sensor includes an in-line check valve. There is a flow indication groove on the back of the sensor mount that should be parallel with the flow. Maximum in-line pressure is 20 psi. See the Single Channel Analyzer (SCA) manual for additional information. The Model 15T Suspended Solids Sensor is intended for sample by-pass lines of mixed liquor, return, or waste activated sludge. The by-pass loop is generally configured using customer supplied full port ball valves on both sides of the tee. 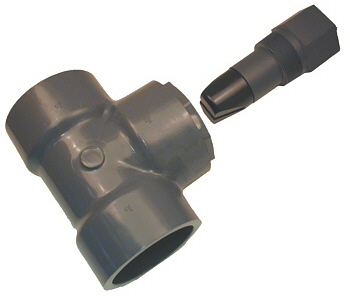 The supplied tee (as shown) is Schedule 80 PVC, with 3" slip connections for process piping and a 2" female NPT connection for the SS probe. The integrated jet clean with this sensor includes an in-line check valve. There is a flow indication groove on the back of the sensor mount that should be parallel with the flow. Maximum in-line pressure is 20 psi. See the Single Channel Analyzer (SCA) manual for additional information. The Model 17A Suspended Solids Sensor combines the ease of use of a hot tap mount with the reliability of the InsiteIG SS Sensor. The mount is a 2" NPT male thread in 316 stainless steel that works with a customer supplied 2" Thread-O-Let, saddle or existing piping. The integrated jet clean includes an in-line check valve. There is a flow indicator on the back of the sensor mount that should be parallel with the flow. Maximum in-line pressure is 40 psi.